The new iPhone 7 and 7 Plus may look roughly the same as their predecessors, but one fairly subtle design change is pretty radical for Apple - the signature home key is not clickable anymore. Yep, the physical home key we've grown accustomed to since the very first iPhone is now of the trendy capacitive variety, with a new Taptic Engine providing the necessary vibration feedback so that the key doesn't feel like a touchpad. Well, that's all fine and dandy and trendy, but how are we supposed to do the last-ditch reboot and reset effort that sometimes is needed on every handset, including the iPhones. Previously, we simply held the home key and power button to force reboot the phone when all else failed, but now there is no click to be registered and the capacitive key has to be powered to work, so what to do during a jailbreak gone rogue? 3. Keep holding the two keys until the iPhone 7 or 7 Plus displays first go dark, and then the Apple logo appears. That's it, you've now successfully and forcefully rebooted your iPhone 7 or 7 Plus without all that much effort, just squeezing it between your thumb and index finger for a few brief seconds. that is very innovative. That is why I like the iPhone. PLEASE, we've had this feature on Android phones for 20 years. Stupid Apple....always copying from Android. S8 coming without home button. Any bets? Does it even matter that much? It's just a different way to reboot. No innovation. Unless you were being sarcastic. Innovative? Because its different way to force reboot? lol? Guys please admit it. Apple has just invented a special way of rebooting the iPhone. This feature was never there in iPhones. I love it. This feature is only for force reboot while the device can't soft reboot...... Most people only use "power off and on again". You like force reboot? For saving time? Come on. TBH, the only thing I like about the new iphones is the 2x optical zoom and f1.8 (I know S7 has f1.7) but iPhone's camera was pretty good as it is it would be interesting to see how much they've improved their already stellar camera. Also, I like how they removed the physical key without changing user experience. Nicely done ! Aside from that its pretty meh. Hate the the airpods as it is one more thing to charge for me. Also, it looks ugly IMO. A jaybird like design would've been better. I don't see why the old process had to change? The home button still registers a press even if it's not a physical button. Perhaps again gearing for the next model with no home button at all... Also - that taptic engine, f***ing look at the size of the thing, there's one of the big reasons the 3.5mm jack went, to fit that enormous block in there. Again, when the home button is removed completely there'll be plenty of space for it AND a bigger battery, that's the only logical reason I can see Apple taking all these steps. Yeah, why can you just hold the home button like usual? Because Apple implements solutions to problems which do not exist. Unnecessary complications. I would imagine because there's the possibility that the capacitive button wouldn't register anymore in some instances, where it always will with a physical button like the power and volume ones. This is the same way you enter safe mode on Android devices, though each one has their own specific way. It had to change because for a capacitive button to work the software has to be working and if the phone's crashed then it isn't. Physical buttons, on the other hand, don't require anything running to register a press. this board is the reason of death for Jacky! 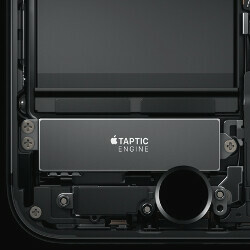 So redo physical home button. Move force reboot to other physical buttons, so they are basically admitting that the new button cannot do this, because it isn't physical, and physical buttons are needed? Kinda funny, makes you wonder how it was replaced, makes it seem mostly because of it being 'new' and 'innovative' yet despite that, not being as able as the old. I wouldn't be too surprised if it breaks just as fast as the old too. It was replaced because it's a moving part and it's the moving parts that tend to fail first. Personally I can't stand Apple, but losing physical buttons does make sense, though obviously you can't lose them all because you'll always need a couple of for a reset. I generally agree that physical stuff can break, but when it comes to buttons...no, I can't tell you how many years I've used my old console joysticks, and the buttons are just fine still, heck my old pre smart phones still work just fine buttons and all. I'm not saying they can't break, obviously how people treat the device can count for a lot, but it really shouldn't be that big of an issue, personally when it comes to iphone repair, the click of the button isn't what has broken, but the glass on it is what has broken, rendering touch id and such useless, the click itself I haven't really heard of breaking. Which is why I think this won't change anything. Buttons fail, it's just a micro-switch and they're only rated for so many clicks. Sure they can last many times longer than they're designed to, but not always. Apple have released information on what the most common failures in iPhones are and the home button has always been the main culprit. Yes it's rare they break, but if a phone hasn't got a fault when it's new the physical buttons are the most likely thing to fail. I agree, that its been an issue that's been talked about, but knowing repair people, break isn't the 'click' but touch id or glass and such, but that's just their experience there. Don't you guys get sick of the exact same arguments in every Apple/Samsung related article? On Android, you just hold down the power button. Does holding down the power button on an iPhone have a different function? What they're doing on the iPhone is similar to how Android devices enter safe mode. That's actually easier, since it can be done with one hand now. This is the way you reboot MS surfaces. Just another copy method from apple. Nothing innovative here... move along people nothing to see here! It's something to see for the millions of people who'll be getting used to the different method of rebooting. You know, the millions who don't use MS. What a stupid post.